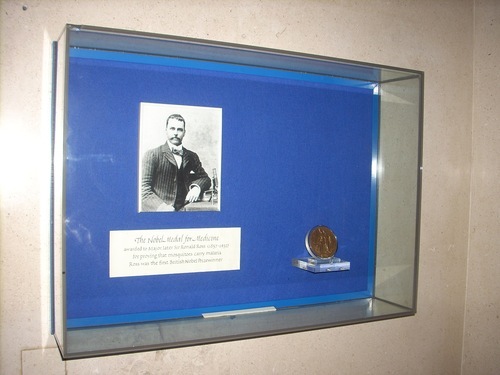 The Nobel Prize medal awarded to Ronald Ross in 1902 "for his work on malaria, by which he has shown how it enters the organism and thereby has laid the foundation for successful research on this disease and methods of combating it"1, is now displayed in a showcase in the entrance hall of the London School of Hygiene and Tropical Medicine in London. 1. Retrieved from the Nobel Prize official website.